A reader asks: I'm considering dual monitors because my 17-inch monitor seems to be shrinking. Sometimes it seems like I spend more time scrolling and tabbing between programs than on actual work. But I'm still not sure... should I upgrade to a big 30-inch monitor, or go with a dual monitor setup? If you've ever wished for a bigger computer screen, here's an even better idea. Get two! Use a dual monitor (or multi monitor) setup to extend your desktop across two or more screens. Windows, Mac and Linux computers have the ability to simulate one BIG screen using a dual or multi monitor configuration. Adding a second monitor will be cheaper than upgrading to a super-size screen, and there are other advantages too. I've used two monitors on my PC for many years. Ten years ago, I got a pair of 22-inch monitors with a new computer. When they finally died (with two days of each other) I replaced them with dual 25-inch flat-panel monitors and I love it. I set both monitors on my desk, side by side, and a bit of software magic creates the illusion of one giant screen. I can open a website on one screen, and a word processor on the other, then copy and paste from one screen to another. I can even open a spreadsheet and stretch it A-L-L T-H-E W-A-Y across the full width of both screens if I want. Personally, I find that all the extra desktop space makes me much more productive and greatly enhances the fun of computing. When I am forced to use a laptop or desktop computer that has a single screen, I notice the limitations right away, as the extra scrolling and alt-tabbing becomes tedious. Others have told me that after ten minutes of using a dual monitor setup, they can't imagine living without it. Published studies indicate that having a dual monitor in a workplace setting can increase productivity by 20 to 50 percent. For example, if you're a computer programmer, it should be obvious that having your source code on one side and your program on the other side of a dual monitor display would be very helpful. Real multi-tasking requires enough screen space to keep two or more apps in full view simultaneously. If you have ever tried to size and align windows on a single monitor, you'll appreciate the ability to have several apps fully open at the same time. Customer service reps and web designers are additional examples of people that would benefit from dual monitors. Cutting and pasting between documents is much easier when you don't have to alt-tab between them and scroll up or down so much. If you create newsletters or PowerPoint presentations, you'll identify with this. Picture and video editing is a whole new experience with dual monitors. You can have all of your editing tools on one screen while you work on the project in the other. You can compare before and after views of the same work, or supersize panoramic pictures. Comparing products is easier when you have dual monitors. You can show two video cameras' specs side by side in separate browser windows, for example. Video and gaming take on a whole new dimension with dual monitors. You can view much more of a virtual world and see bad guys coming from a distance. Some gamers like to have Skype or another chat app open on a second screen. Windows 8 and 10 offer some new multi-monitor features, such as the ability to use different backgrounds on each monitor, span multiple screens with your background image, and multiple taskbars. Okay, that was seven reasons, and I'm sure I could list more if I rubbed a few brain cells together. Despite all that, a Microsoft study showed that less than 15 percent of all PC users have a multiple monitor configuration. But now that you know all of the benefits, let's move on to the actual nuts and bolts of adding a second screen, to make your dual monitor dreams come true. Windows XP, Vista, 7, 8 and 10 and Mac OS X have built-in support for dual monitors. Setting up dual monitors takes about five minutes. But first, you need to make sure you have the right hardware. Almost all laptops have a VGA, DVI, HDMI or DisplayPort connector where you can plug in a secondary monitor. If you have a spare monitor, and the video cable required to connect it, that's all you'll need. If your video cable has a different connector than your laptop, you can buy an adapter to make ends meet. On a desktop, you will need two video connectors on your PC, matching connectors on the two monitors, and of course appropriate cables. Some desktops come with two video ports, but if you have only one, you can add a second video adapter, or swap yours for a dual-port model. Adding or swapping a video adapter sounds geeky, but it's actually a pretty easy upgrade. After popping the hood on your system unit, the video adapter simply plugs into a slot on the motherboard. If you know how to use a screwdriver, you can do this. Some computers, however, simply lack the capacity for internal hardware upgrades. In these unfortunate cases, there are ways to get around this limitation, such as the Matrox Graphics DualHead2Go, which functions almost identically to a standard video card, yet is actually an external device that makes use of your existing video out port. With DualHead2Go, you can add an additional display to your PC or Mac desktop, or another two monitors to a laptop. On Mac OS X and most Windows computers, your second monitor should be automatically recognized and enabled. 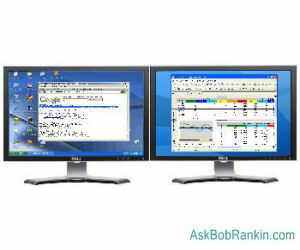 To set up dual monitors on Windows 7 and higher, open Control Panel, choose Hardware and Sound, then under the Display heading, choose "Connect to an external display." Connect your second monitor to the computer. The Display window will flicker (or go blank for a few seconds), then you'll see a dual-monitor setup screen like the one shown here. If you don't, click the "Detect" button. If that does not work, check the monitor's connection to your computer. "Duplicate these displays" shows the same display on both screens. This is handy when monitoring a presentation on a laptop while it is displayed on second, larger screen. "Extend these displays" makes one big screen out of the dual monitors. You can actually drag objects across the boundaries of the two monitors. This is the setting that most people use, and the one I recommend. "Show desktop only on 1" or "Show desktop only on 2" disables one of the monitors. 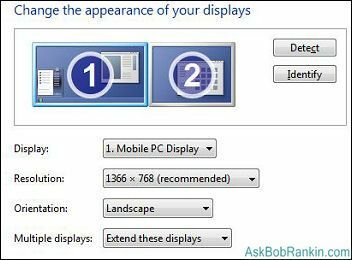 Adjust the screen resolution of the monitors as desired, press Apply, and you're done. Dual monitors are not for everyone. They take up more desk space, obviously. If you are a programmer, graphic artist, website designer, author, editor, proofreader, support technician, gamer or power user, dual monitors will boost your productivity and definitely look cool on your desk. If you're just an every-day ordinary computer user, I think you'll find there are benefits you didn't expect. Most recent comments on "Dual Monitors: Good Reasons to Upgrade"
I do understand that have multiple monitors can be a great tool for work or the work environment. I do have a TV in my bedroom, where I also have my computer desk. So, I am listening to TV when reading my e-mail. Have had dual monitors for a few years now! I run the extended desktop setup. My desktop PC has 1 each VGA, DVI, & HDMI connections but the motherboard document states only supports dual monitors if connected to the VGA and DVI connectors. One monitor connected via DVI is actually a 24" HD TV that the sound is crap on and the other is a 17" Dell Monitor that we have turned to portrait (rotated vertical vs horizontal). Wife uses the 17" one for email (vertical setup is great for email) and the 24" for all other programs as well as the main desktop. After I did this setup she cannot live without it now. Helps her greatly in her work. You say nothing about using dual monitors with Linux systems. I tried it for a while but found it annoying. I went back to one screen. I have an iMac and need to run Windows from time to time. Thus OSX on one screen and Win 10 on the other! @Steve >> You mean to say OSX and Win10 side-by-side get along well w.o bickering?? I am currently running two Acer 27" WQHD monitors that are being fed by AMD/RadeonR9 graphics card with dual DisplayPorts connections. Win10 Wake-from-sleep always refreshes the desktops by re-arranging all the open application windows back to Monitor#1. WallPaperMasterPro utility is a great program that I have been using on dual monitors for years. There is a FREEware version now and can be downloaded at http://jamesgart.com/wallpaperchanger/. When I worked for DEC in the 80/90's, I asked about getting two monitors. I was met with an odd combination of denigration and resentment. Where is DEC now? I have two 24" monitors on my desktop. Actually, one is slightly smaller than the other. For a while, I had a 19" as the second monitor, but it was a pain when dragging from the 24 to the 19. "When they finally died (withIN two days of each other)". I used 2 monitors for a few years at a previous job; very helpful. When I started doing contract work, at-home, (after being layed-off), I purchased a 2nd monitor. I found it invaluable, for all of the benifits mentioned. I can't stand having multiple apps/windows open, but hiding behind each other. Why stop at two monitors!! I have a three monitor setup using Plugable Technologies USB adapters. With their products you can build a system with up to 14 monitors! I love my 3-screen setup and can't imagine working without it. Yes, but : how do you position them ? If they are centered relative to your line of sight, you're now staring right at two nice vertical bars of black plastic. And if you keep one monitor centered and the other on the side, the latter is way off-center, and you have to turn your head to see it. How do people solve that problem ? Also, where is the Windows taskbar ? Is it cut in half ? Duplicated ? On one monitor but not on the other ? I work in two languages and one of my peeves about Windows 10/Office 2013 is that I can no longer have windows or tabs in my browser open in the two languages. This means that when I look things up I keep having to change language and then change back (bi-directional languages, on top of different alphabet). Would dual monitors be able to work at the same time, each in a different language? At work we setup a lot of New Computers, often Dual Monitors. It is recommended that Dual Monitors are using the same connections(eg: DVI x 2 or DP x 2 or HDMI x 2), and not mixed connections(eg: DVI x 1 & VGA x 1). With the mixed connections the resolutions can be are different or even the same, But the Image will Always be better with Digital. The Digital(DVI,HDMI,DP) Image will always be sharper that the Analog(VGA). Analog & Digital together, your brain has to keep adjusting your eyes, each time for the different Image qualities and this will make you tide irritable. So always try and put both Monitors DIGITAL & DIGITAL so the images are both the same quality. As a batch programmer I would often have open my source code, the JCL to run a batch job, the input file(s) and my results (files and/or reports) when I was working on a project. Testing interactive programs was a similar experience. I was amazed when I tested an HDMI port on my computer and found that it gave me dual monitor capability. I really expected 2 of the same image. 2 monitors is nice! I use dual monitors and often split one or both in half. With Windows, use the Windows logo key plus left or right arrow to move open program to the left or right half of the screen. Example: on one monitor I may hold down the Windows logo key and then press E, left arrow, E, right arrow to open two copies of File Explorer and easily move files by dropping and dragging. Or, open two copies of Word and use Windows logo key plus left or right arrow to see two documents side by side on one monitor. With two monitors and one or two programs open on each, it is really nice to see 2, 3, or 4 programs at once. I'm still trying to drive a monitor while using my chromebox screen. Seems to be an either/or situation,a major shortcoming for chrome/linux. I have used dual monitors on my desktop for many years and would not change back to just one. When I have to take my laptop out with me, I have to use 2 programs on the same screen - but Windows 10 makes that really easy. Open one program and press the Windows key and the left arrow - open the other and do the same with the right arrow and there you have it, 2 programs neatly aligned on one screen. I now use three monitors and, for the life of me, I don't know how I functioned with only one! Loved 2 monitors at work. Upon retirement, I came across a 2nd 24" monitor. Hooked it up....and up the video card. It wasn't designed for 2 monitors (memory issues). $80 (including installation costs) and I'm up and running. Run 2 separate screens (actually have 2 computers, each with 2 monitors, running stock trading info).